Eat to the Beat returns for the 23rd annual culinary gala, featuring 60 top female chefs while raising funds in support of breast cancer. The event conveys a powerful message and the strong support for women through the challenges. The event took place at Roy Thompson Hall, sponsored by the Canadian Cancer Society GTA (CCS), filled with great food, drinks, and fun for this great cause as proceeds are directed to CCS programs and services to help support anyone living with breast cancer diagnosis. The program exists to ensure no one faces breast cancer alone, with programs connecting people with volunteers, information and help cope through the challenges. Eat to the Beat has grown through the years, along with its support. Throughout the evening, while sampling specially prepared savoury and sweet dishes from chefs. Attendees will notice the favourite Corset Ladies, a group of supporters and survivors who design and wear beautiful, food-themed corsets, throughout the evening. 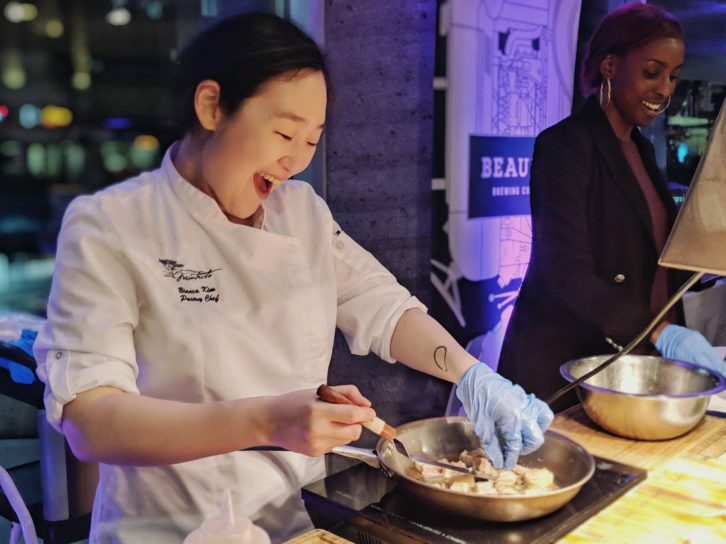 A new feature to this year was the “Up-and-Coming Chef Challenge”, presented by KitchenAid, featuring talented female chefs-in-training from five prestigious culinary schools in Ontario. The winner was Centennial College’s chef, Anna Choi, for her dish of kombu-cured salmon with ponzu caviar, spiced puffed rice, wasabi crème fraiche, yolk gel, pickled onion and parsley powder.